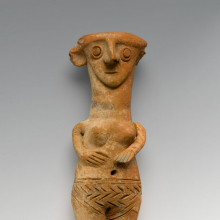 Several different types of female figurines were made in Cyprus during the Late Bronze Age. Naturalistic examples like this one were painted on the head, face, neck, and pubic area. The flattened head probably represents a cap. Excavated examples from tombs at sites such as Enkomi suggest the figurines had a funerary or afterlife role but their appearance in settlement and ritual contexts may indicate several functions. Unlike other figurine types from this period, these are not shown carrying a child in their arms, suggesting a cultural view of late Bronze Age women unconnected with motherhood. 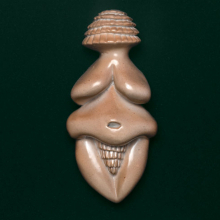 Judy Chicago’s embodiment of the goddess evokes the rare and earliest known female forms of the Paleolithic period, like the Venus of Willendorf, made about 25,000 years ago. Ceramic Goddess #3 is a larger version of one of four female figurines sewn onto the place setting runner for the Fertile Goddess at The Dinner Party, and one of about a dozen original “little goddesses” that Chicago made at the time. The artist also made an edition of cast goddesses that was used to raise money for The Dinner Party. Feminist re-examinations and interpretations of ancient female figurines, especially Marija Gimbutas’s The Goddesses and Gods of Old Europe (1974) and Ilse Seibert’s Women in the Ancient Near East (1974), were a revelation to Chicago. As she explained to this exhibition’s curators: These goddess figurines and the early plates on the table and names on the floor [of The Dinner Party] were intended to convey the idea of women’s power in early societies, [a] power that gradually declined as patriarchy took shape and was enforced through law and custom. One of the ways in which male dominance is maintained is through the idea that it is and always has been the norm, which was not supported by this goddess imagery. Who is she? A goddess, a ritual object, a votive offering, a vehicle for working magic or fulfilling wishes, a talisman for protection, a teaching or initiation device, or simply an ancient woman’s embodiment of herself? The oldest sculpture in the Brooklyn Museum represents a woman; it was made by people living in Mesopotamia (modern Iraq) or Syria in the late fifth millennium B.C.E. She and other ancient female figurines with exaggerated or highly stylized female forms are small in scale but great in their ineffable power to capture the imagination of those who confront them. Nine such ancient figurines from the Museum’s collection are the focus of this third Herstory Gallery exhibition, which explores them as a source of inspiration for Judy Chicago’s depiction of The Fertile Goddess in The Dinner Party. The tenth figurine, on loan from Judy Chicago, is the Ceramic Goddess #3 (1977), a larger version of the female figurine on the place setting runner for The Fertile Goddess at The Dinner Party. This contemporary embodiment also evokes the rare and earliest known female forms of the Paleolithic period, like the iconic Venus of Willendorf, made about 25,000 years ago. Important to Chicago was the feminist re-examination of ancient female figurines from the 1960s on, interpreting them as manifestations of goddess-worshipping societies, which was at the fore of feminist thought at the time. Feminism and gender theory have influenced archaeology considerably since Chicago created The Dinner Party. Indeed, a new wave of archaeologists who excavate and study these figurines are applying new methods and often challenging earlier interpretations and nomenclature. 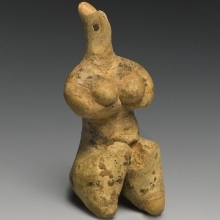 For this reason, the curators have consciously chosen the currently preferred term “female figurine,” as opposed to “idol” or “goddess,” in order to acknowledge the many levels of function and meaning that have been ascribed to these objects over time. Nonetheless, it cannot be denied that, thirty years after the creation of The Dinner Party, the significance of goddess images to feminist scholars and artists, as well as practicing Wiccans and Neo-Pagans, has not diminished but acquired a life and mythos of its own, apart from the archaeological record. This exhibition is co-curated by Madeleine E. Cody, Research Associate in Egyptian, Classical, and Ancient Middle Eastern Art, Brooklyn Museum, and Maura Reilly, Founding Curator of the Elizabeth A. Sackler Center for Feminist Art. 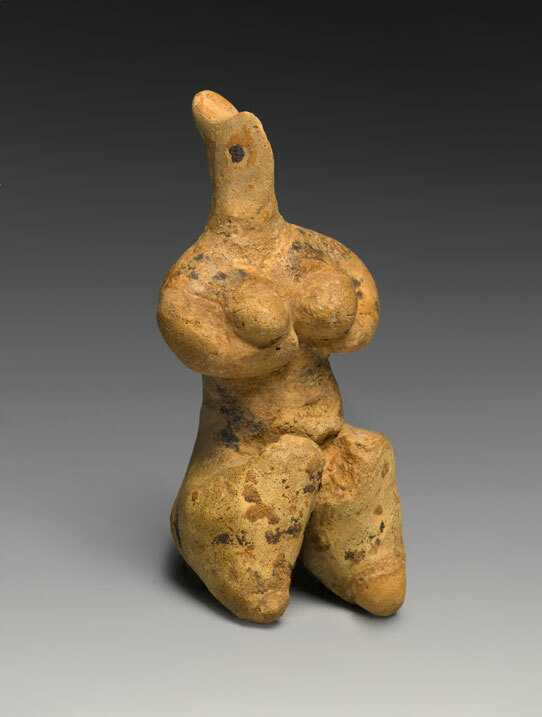 In conjunction with the exhibition The Fertile Goddess, scholars Ellen Belcher and Diana Craig Patch discuss early female figurines of the Neolithic Period from ancient Mesopotamia and of the Predynastic and Early Dynastic Periods from ancient Egypt. Moderated by exhibition curator Madeleine Cody, the panel investigates issues of interpretation, function, and provenance that have influenced how herstory is uncovered. The panel was held at the Brooklyn Museum on March 14, 2009.